Tukhta: the tyranny of inflated performance figures. I’m sketching out a book on the early Soviet Union and artistic movements (don’t ask) so I’ve been rereading every Russian author I can get my hands on. I read a lot of these works when I was (probably too) young, starting from the very easy and shallow slopes of “Ivan Denisovich” and then plunging down into “Gulag Archipelago”. One of the things that comes out starkly from Solzhenitsyn’s account of the forced labour camps of “Gulag Archipelago” is the way that unrealistic expectations from an overbearing superior organisation can easily lead to an artificial conformity to productivity requirements, which leads to people cheating to achieve their overly ambitious quotas. In Solzhenitsyn’s words, the many thieves in the camp (he is less than complementary about non-political prisoners) coined the word tufta, which he rendered into better Russian as tukhta, the practice of making up your quotas through devious means and fabricating outputs. This could be as simple as writing down a figure that didn’t reflect your actual labour or picking up a pile of timber that had already been counted, moving it somewhere else, and counting it again. 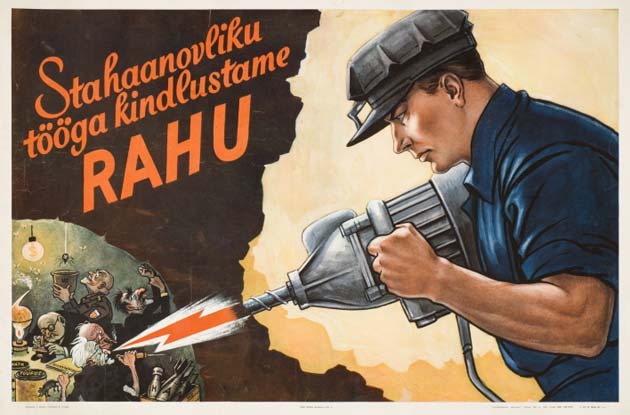 The Stakhanovite movement means organizing labor in a new fashion, rationalizing technologic processes, correct division of labor, liberating qualified workers from secondary spadework, improving work place, providing rapid growth for labor productivity and securing significant increase of workers’ salaries. Pretty good, right? Now consider that the namer of this movement was “Aleksei Stakhanov, who had mined 102 tons of coal in less than 6 hours (14 times his quota)”. This astounding feat of human endeavour was broken a year later, when Nikita Izotov mined 607 tons of coal in a single shift! It’s worth noting that fully-mechanised and highly industrialised contemporary Australian coal mines can produce round about 3,800 tonnes every 6 hours. What a paltry achievement when all you need is six Nikita Izotovs. So this seemingly well-focused initiative, structured as a benefit to state and worker, is disingenuous for the state and dangerous for the worker. You’ll note the anti-intelligensia and racist imagery on the poster as well – ideologically these were all wreckers. Imagine that you are a worker trying to keep yourself and your family alive in the middle of famine after famine – of course you want to meet the requirements as well as you can, potentially even exceeding them so that you don’t get sent to a camp, locked up, or demoted and diminished in your role. While some people might be practising tukhta out of laziness, you are practising it because it is the way that things are. You need to nod in agreement with ridiculous requirements and then write up your results in a way that exceeds them, if you want to survive. Your reward? Even more ridiculous requirements, not determined in capacity and available inputs but in required output. Tukhta is your curse and your only means of survival. Unsurprisingly, the Stakhanovite movement was denounced as part of Stalinism later on in the emerging and mutating Soviet Union. Now imagine that you are a student. You have been given a pile of reading to do, a large collection of assignments across a variety of subjects that are not really linked to each other, and you are told that you need to do all of this to succeed. Are you going to deeply apply yourself to everything, to form your own conceptual framework and illuminate it through careful study? Well, perhaps you would, except that you have quotas to achieve and deadlines to meet and, around you, other students are doing better, pressing further and are being actively rewarded and encouraged for it. Will you be at least tempted to move things around to achieve your quota? Will you prioritise some labour over another, which could be more useful in the long-term? Will you hide your questions in the hope of being able to be seen to not be a bad student? Measurements that pit us against almost impossible standards and stars so high that we probably cannot reach them grind down the souls of the majority of the population and lead them into the dark pathways of tukhta. It is easy to say “Don’t cheat” or “Don’t work all weekend” when you are on top of the pile. As the workers in the Gulag and many Soviet Citizens found out, doing that just lets the people setting the quotas to keep setting them as they wish, with no concern for the people who are grist to the mill. Tukhta should not be part of an educational system and we should be very wary of the creeping mensuration of the academy. You don’t have to look far to see highly celebrated academics and researchers who were detected in their cheating and were punished hard. Yet a part of me knows that the averages are set as much by the tukhtaviks that we have not yet detected and, given how comparative was have made our systems, that is monstrously unfair. Assessing how well someone is performing needs to move beyond systems that are so pitifully easy to game and so terribly awful to their victims when they are so gamed. Having just read the relevant chapter in Solzhenitsyn’s Gulag (“What The Archipelago Stands On”), this is an excellent summary and a very perceptive application of the concept (tukhta) to our more common lives: it’s not at all isolated either to the gulag or to history, but rather is the method of any self-deceiving system that inflates brawn with boasts but is hollow at the core. Example: Trump is all tukhta. Thank you – it’s a shame that it’s still so apt.